If only Texas had its own network. Oh wait! Okay, so maybe he doesn’t really hate the Longhorn Network, but he apparently isn’t that crazy about it either. VIDEO: Brown concerned about Longhorn Network? This was originally reported by OrangeBloods.com, however, Frank Schwab has a brilliant write-up posted on the “Dr. Saturday” blog (Yahoo Sports) that I highly recommend reading.
. . . Mack Brown . . . said the Longhorn Network is negatively affecting the Longhorns. Yes, the same Longhorn Network that was to provide such a recruiting advantage that the use of high school highlights on the network had to be banned after conference rivals revolted. The same LHN that gives Texas $15 million per year to pump into its athletic budget. The same network that is such an edge for Texas, it almost tore the Big 12 apart. This network, Mack Brown insists, is suddenly bad for Texas. The whole thing comes off as whining in the worst way, like lottery winners complaining about how much they were taxed. 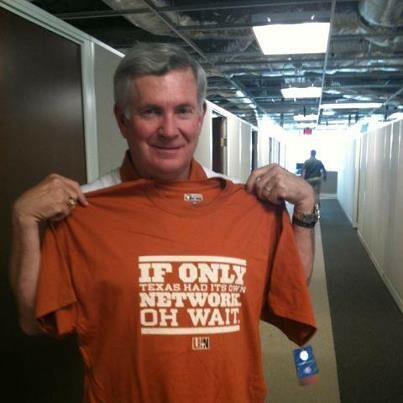 Does Mack Brown really think that fans will believe that he had no input into the deal with ESPN? That no one asked his opinion, not once? That ESPN, Longhorn AD DeLoss Dodds, and University President Bill Powers, all told Brown to just be quiet? Sorry Mack, no one is that stupid. So, Texas fans, if you’re upset your team is tied for fifth place in the Big 12 with a 2-2 mark, you know who to blame, and it’s not Mack Brown. Blame the Longhorn Network instead. Read Frank Schwab’s entire article HERE. Mack Brown may have stepped in it Monday after complaining that he’d rather not have to bother with the Longhorn Network. Brown said that he “didn’t ask for” the $300 million ESPN Longhorn Network. It was a somewhat shocking statement since the ESPN produced Longhorn Network is a first in college sports and will net the athletic program $300 over 20 years. Brown claims it eats up too much time and gives competitors inside information into the Texas’ strategy. Brown plans to take the Longhorn Network issue up with the university officials. . . . It’s a not a good time for Mack Brown to run down the Longhorn Network. Mack’s performance in the past couple of seasons has been mediocre at best. Critics began wondering if Brown should go after the Horns were crushed by Oklahoma . . . Now the heat is on and the Longhorns don’t seem to be that interested in a cable network showing highlights at a time when there isn’t much to highlight. Plus, Mack is one of the guys who sold the public on the Longhorn Network. He was in the ads. It’s a little hypocritical for a man who makes $5.2 million a year to be crying about his exclusive cable network. You can read this article, in its entirety, HERE. Yes, even Sports Illustrated got in on covering this one. You can see what they had to say by clicking HERE. This entry was posted in 2012, LHN by Travis Normand. Bookmark the permalink. LHN was the final straw for Texas A&M. They joined the best conference in the nation as a result of the t.u. greed.